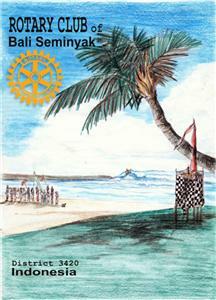 The Rotary Club of Bali Seminyak (D3420 Indonesia), sends you greetings from Paradise. We are the ONLY English speaking Club in the Kuta area (Tuban/Legian/Seminyak/Kerobokan). Our Club meets twice a month , look our calendar 12:00 at the Trans Resort. Our Club was chartered on 14 May 2002 and consists mostly of expatriates living in the Kuta area. A majority of the members work directly or indirectly in the Tourism Industry, e.g. hotel management, restaurants, property management, marketing, diving, real estate rentals, and training. Other classifications include; architecture, education, export, steel brokerage, finance management, medicine, transportation and entertainment/technology solutions. The members, during the past fourteen years, have been very active in a wide range of Projects here in Bali and around Indonesia, e. g. Cleft Lip/Palate Operations, Elementary School Library, Leprosy Detection and Eradication (MG), Malaria Eradication (MG), Microcredit for farmers in Nusa Penida (Goats), Retirement Home, High School & University Scholarships / Student Loans, Water Filters (MG), Water Wells (MG), Women's Vocational Training (MG), and many more. For further information about our Club Projects or to make a Donation, please send me an email. Visiting Rotarians please drop by and spend a relaxing, humorous luncheon with our members. We enjoy making you feel even more welcome in Paradise.